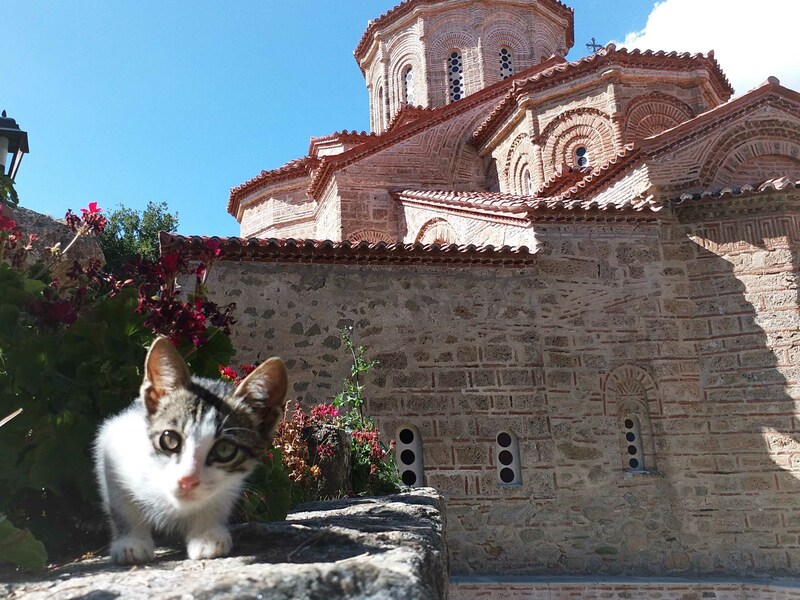 The new and the old – The cutest kitten at the Great Meteoron Monastery. After Agent Q* booked her tickets to Greece, we had to decide where we would go for her three-week holidays. I was hoping to do the bare minimum in Athens and then keep her in Crete where I’m currently living so that it would be nice and easy. But she had other idea – Meteora. I knew why. Meteora is unique and majestic. I thought perhaps based on her answer, I could offer her somewhere that was a bit closer. It takes five hours to travel to Meteora from Athens by train. Hm. I could offer her no alternatives, especially since she willingly accepted that I would only go to either Santorini or Mykonos with her, but not both. I was relieved that she chose Mykonos because I encountered too many mutant Greek people who thrive on ripping tourists off in Santorini during my family’s recent visit there. Monastery of Varlaam, image taken by PhotoMan over 10 years ago. I visited Meteora once before, more than ten years ago, with my friend Guru Pang who was a travel journalist then. PhotoMan** drove us there from Athens and back on the same day. We were all super tired afterward from being stuck in the car for so many hours. It is also not so easy to drive in the Greek highway. Greek people often speed quite a lot and so PhotoMan had to be extra careful and was exhausted from the concentration. Taking the train is much more pleasant although the trip would definitely be easier if you hire a car once you arrived Kalambaka which is the village right next to Meteora. Neither Agent Q nor I drive so that option was out and we debated whether to join the local tours. The cheapest price we found was 25 euro per person for a 4 hours tour. So if we were to join a tour for both days, it would be 50 euro each. It seemed quite nice to not have to think about the route but we didn’t exactly like to be herded around. Then by chance I got talking with my Greek friend and fellow QHHT practitioner Hara Katsiki. 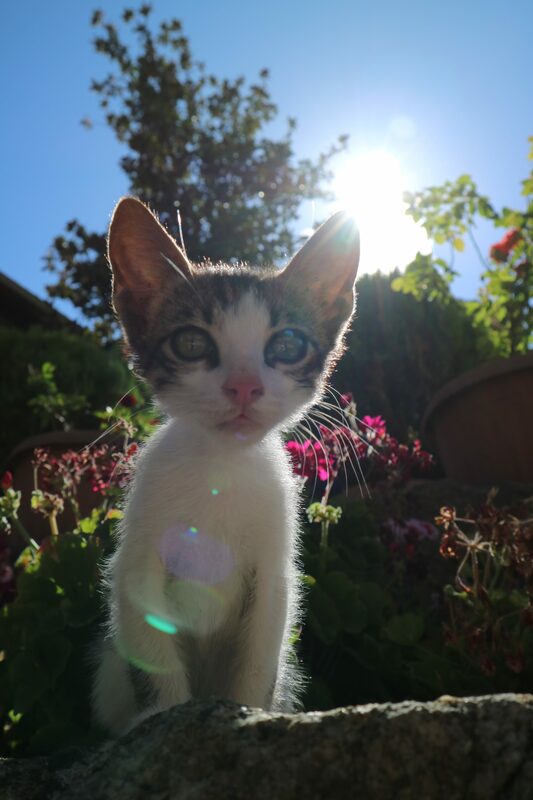 I told her about our trip to Meteora and asked her if she knew what we should do. Hara is a walking encyclopedia of all things metaphysical and these are often our topics for discussion. She probably mistook my travel advice query for life purpose sort of question. Let me explain a bit what she meant. Simply put, we all vibrate in a certain level and carry certain coding. Where ever we go, we carry this energy with us and sometimes we are helping the land or space that we are in without us knowing it. When we are in the right place at the right time, we also raise our own vibration and receive downloads and upgrades thanks to the energy of the place. There is always an energetic exchange. Hara probably thought my question was what I needed to do to help the land because I enjoy doing this sort of things. If you are drawn to visiting certain places, it could be because your vibration is needed at those places, or those places would help your energetic level, or both. There are also cases where people have past lives in these places and they wish to revisit, especially if those lives they had were happy ones, or if there is a lesson to learn from. These reasons are often unnoticed though. Usually people think they want to go because of the photos they saw or reviews they read. What to do if you would like to help heal the land and space? I asked some of my colleagues this question. Most agree that just by being there is enough. Some gave examples of what they would do. Let me sum it up by saying that it’s all about expressing your love and gratitude whichever way you like. You could say ‘thank you’ or just feel the gratitude for the beautiful Earth. You could sing. I like to bring my singing bowl with me and play for the land and ocean and all living creatures. Back to what to do in Meteora. Hara’s comments didn’t help much but then it did. It helped me realized that it was alright to just go where my friend wanted to go. We didn’t have to have a perfect plan. Just by having my friend with me was already a perfect trip. We tentatively decided to take the cheapest option to visit the monasteries which was to take the public bus. We couldn’t find much online information about the buses but then the day before our visit, we bumped into my friend Tiffany Panda in Monastiraki (central Athens). 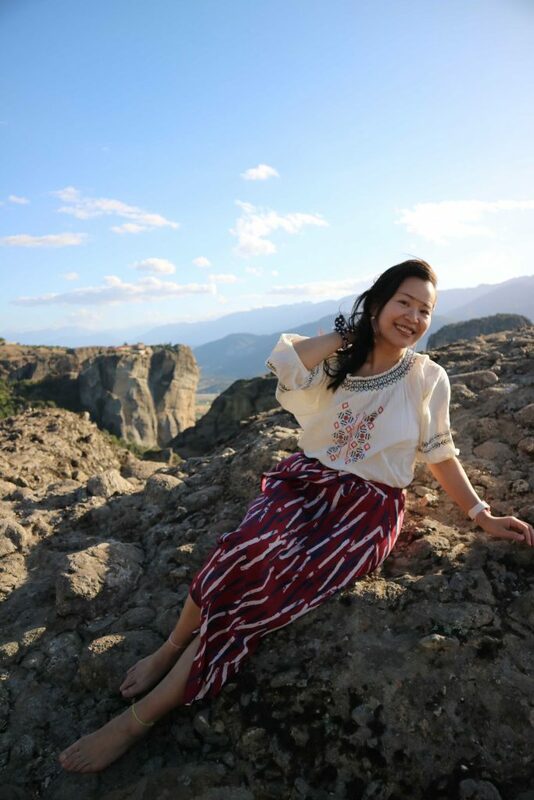 Tiffany is also from Hong Kong and she has been living in Athens on and off for over a year now. She and her friend had just come back from Meteora the previous day and said it was very easy to take the bus. What were the odds of bumping into another Hong Kong expat who could offer exactly the information we needed? Finally I relaxed, thinking that the trip would be nice and easy. And it was. We decided to spend one night at Kalambaka, the village near Meteora, so that we didn’t have to rush. If I were to go again, I wouldn’t mind staying another night there because it was so nice spending time up the mountains. Meteora is definitely more than just the monasteries. The landscape is simply breath taking with the straight up and down rock formations. Photo opportunities are everywhere. The highlights of our trip were the times we spent taking photos of the scenery and of each other. Other visitors gave us curious glances because we were totally immersed in our photo-taking. We even directed some of them for the best spots and took photos for them. Honestly I had imagined a peaceful and quiet time at Meteora. Not a chance! Tour buses were everywhere and not just outside the monasteries either. The tourists were herded to cliffs where there were great photo opportunities. There were also vans taking more tourists who signed up the 4 hours tours. Some come with their own cars or motorbikes, or like us, by public buses. There were real pilgrims too. We saw a man who used wheelchair and his friend carried him into the church at Agios Stephanos which is the most wheelchair-friendly monastery, without the long and winding staircases access like other monasteries. We also encountered a group of monks and nuns from Italy. A man who had a stall selling souvenirs told us that there were many pilgrimage tours from Russia that had two drivers onboard driving day and night with minimum stops. 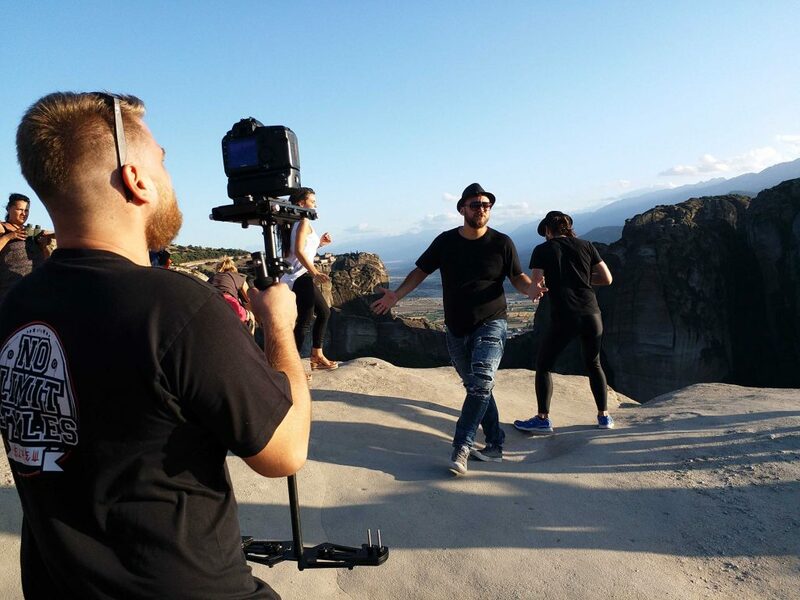 I almost got famous there in Meteora! Like many other visitors, Agent Q and I stopped by a cliff to take photos. It was nearly sunset time and most of these visitors had already secured their spots for sunset-watching. They seemed quite entertained by this small group of professional-looking people who looked like they were filming a music video. I started talking to one of them who told me that the man who took centre stage was a famous singer here in Greece. He asked if I wanted to be in the video. Okay! They spent about 2 minutes showing me the steps (step front and back with head up and up) and I was filmed for about 4 seconds. I only remember the first name (Vasilis) of this supposed to be famous singer and so far, none of my Greek friends could identify him. Perhaps he paid for a ‘Pretend to be Famous Tour’? If you know him, let me know! I’m still hoping to have made my debut in a music video! During the Ottoman Occupation, it was prohibited to practice Christianity. 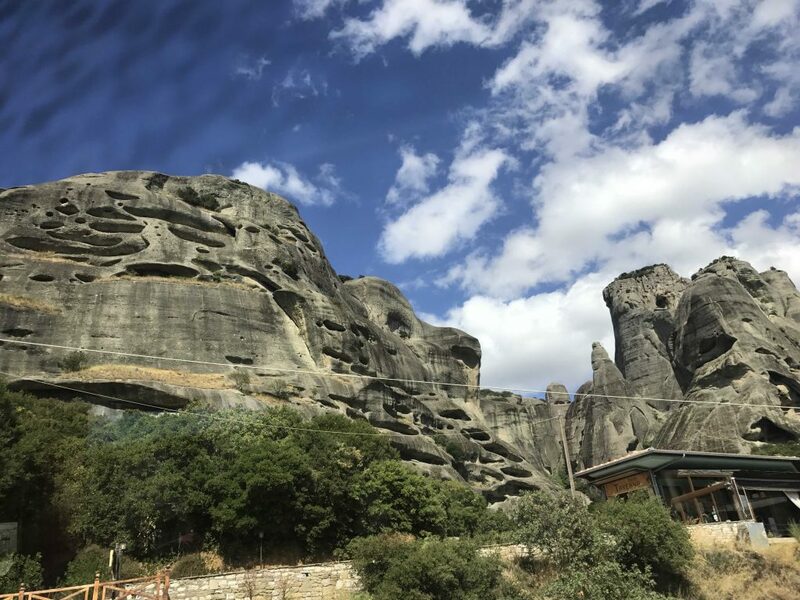 In order to keep their faith alive, many monks went hiding and some of them built monasteries in Meteora because it is isolated and they made the monasteries very difficult to access. There are six living and working monasteries. All of these monasteries close for one or two days every week depending on summer/winter time so it’s best that you check the time table for better planning. The entrance fee for each one is 3 euro. Agent Q and I visited four of them. Let me describe them best I can to help you decide which one to visit. Can you see all 4 monasteries in this photo? I read that some people stayed in those caves for spiritual growth. People put pieces of paper with their wish inside gaps of the rocks. 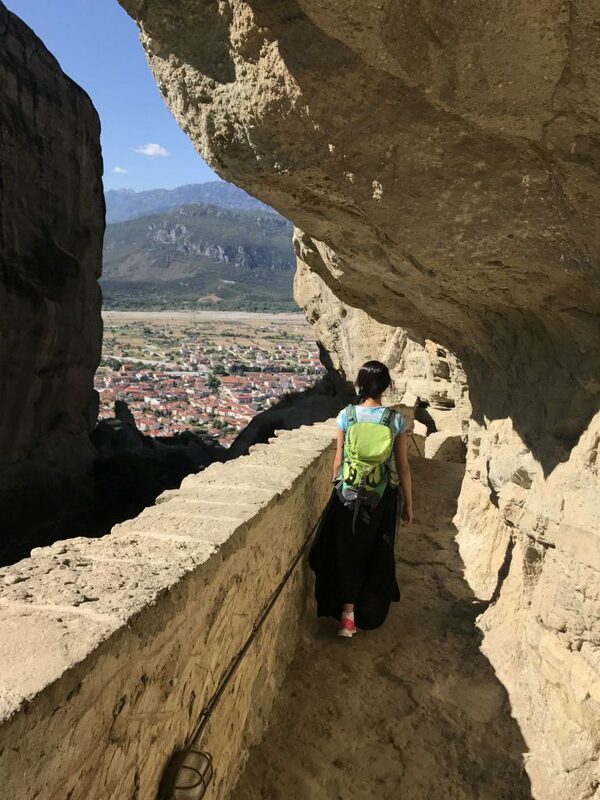 Also known as Metamorfosis Sotiros Monastery, the Great Meteoron Monastery is the largest monastery in Meteora, and the best value for the 3 euro entrance because there is a lot of things to see inside. Other than some Orthodox faith related exhibits, there is also a small museum about the world wars, a wine cellar, and more. I especially enjoyed looking at the pictures of the new martyrs. 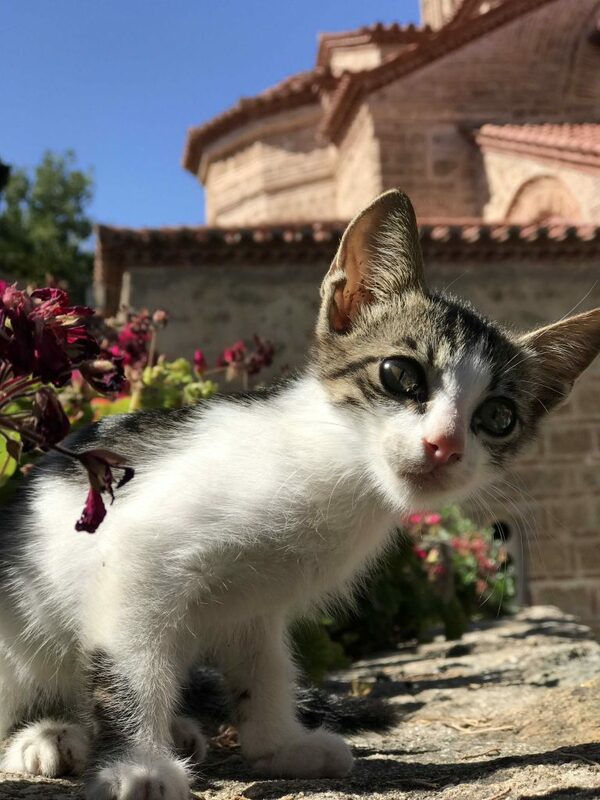 With all those exhibits, the feeling of this monastery is rather solemn but then while we settled in a quiet corner of the courtyard to eat our snacks, we encountered this cute little kitten and our joyous mood returned. We spent nearly 2 hours inside the Great Meteoron. There is a small shop inside selling icons and also a small range of souvenirs like soaps. You have to walk many steps to access the Great Meteoron but it’s definitely worth it. My Greek friend told me that Varlaam (it’s not a Greek word) means ‘All Saints’ so this monastery is dedicated to all the Saints! Perhaps that’s why the shop there has the best variety of icons. The workers inside were very helpful to locate the ones that I was looking for to give my Greek friends. There was a monk whom I asked for help initially. He didn’t talk to me at all and instead, he asked the workers (all men) to help me. I wonder if there’s some sort of rule that forbade him to talk to women. It is quite a hike to go up to Varlaam but it’s definitely worth it. Other than the usual courtyard and church, there is also a lovely pergola. The view is also amazing. Although there isn’t as much to see as in the Great Meteoron Monastery, Agent Q and I enjoyed our time spent in this pretty monastery the most. Pergola at Varlaam Monastery and Agent Q. One way to get through all those steps is to take selfie everywhere! Also known as Agia Triada (Greek words that mean Holy Trinity), it was my favourite monastery amongst the ones that we visited. There is not really that much to see inside and the decoration is rather simple and not as glorious as the Great Meteoron or Varlaam, but it was the most tranquil and peaceful. 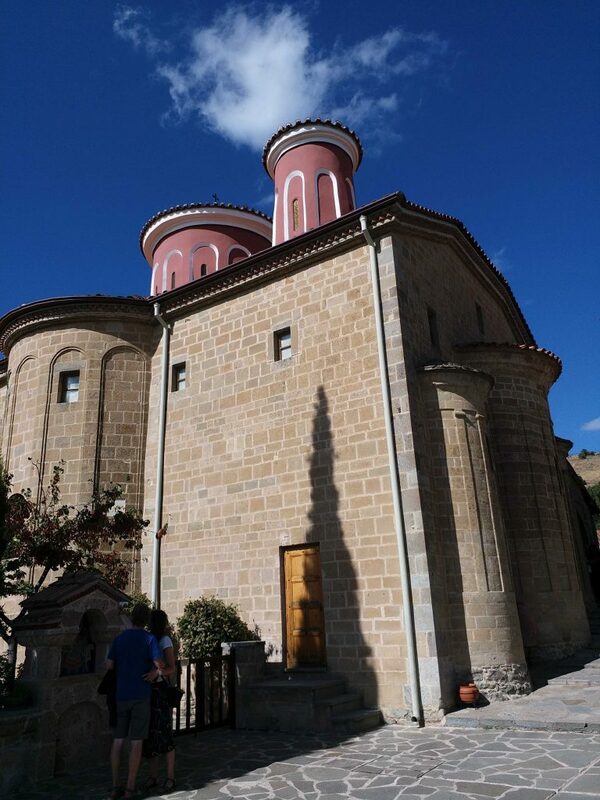 Perhaps the visitors (or tour operators) chose the monasteries that were best value for the 3 euro entrance, or because Agia Triada is the most difficult to access. It took us nearly half an hour to walk up there. I greatly enjoyed the peace and quiet there and I imagine this is what a monastery is all about. There was a man sitting on the steps outside the monastery selling tickets. 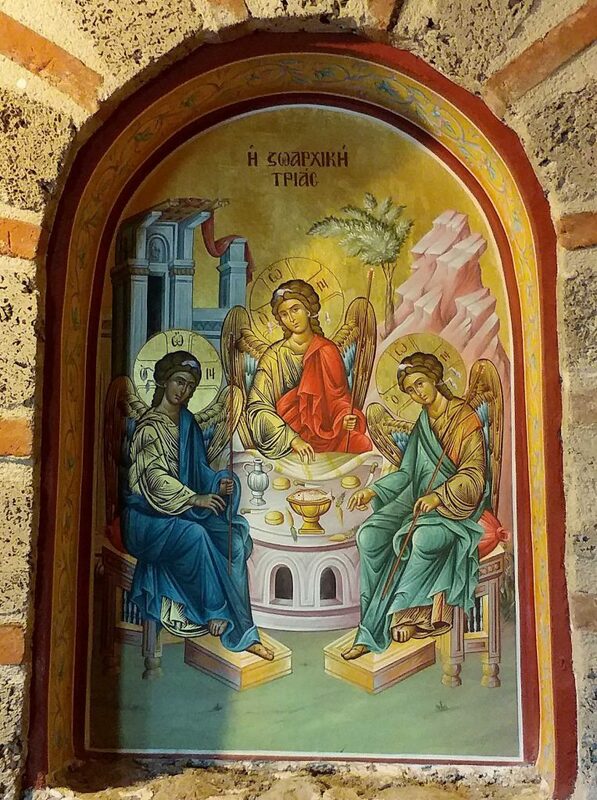 He very kindly explained that although on first glance, the icon of Agia Triada looked like three women, they were in fact three angels and angels do not have genders. They represent the Holy Trinity and often, priests, monks and nuns have encountered them in their prayers because angels are messengers of God and they help bring enlightenment. In Greek, the word for angel means messenger. There is no shop inside this simple monastery. 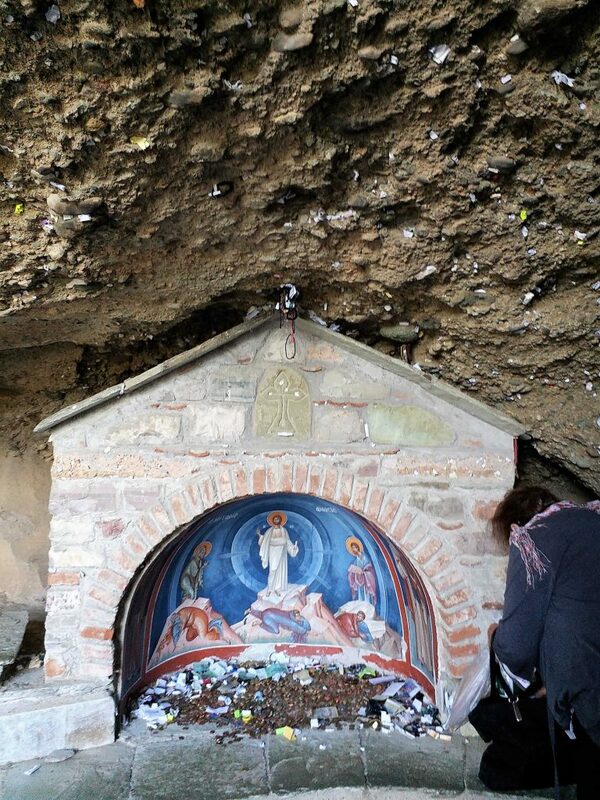 I later bought an icon of Agia Triada from the shop at Varlaam for my Greek friend’s mother. St. Stephen in Greek is Agios Stephanos. 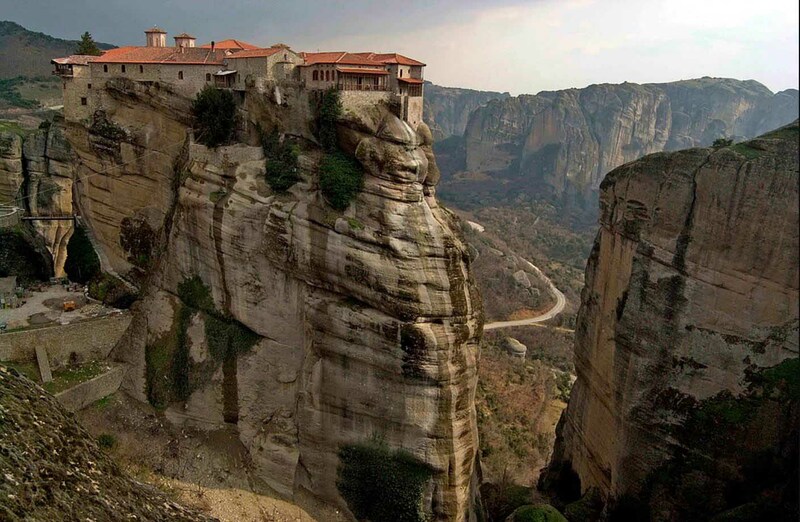 This and St. Barbara are the only two female monasteries in Meteora. It is the most accessible amongst the monasteries. There is a bridge linking the monastery to the road and there are only about 20 steps in total inside the monastery. I really looked forward to visiting this monastery because Agios Stephanos is my name sake. However, this monastery turns out to be Agent Q’s and my least favourite. 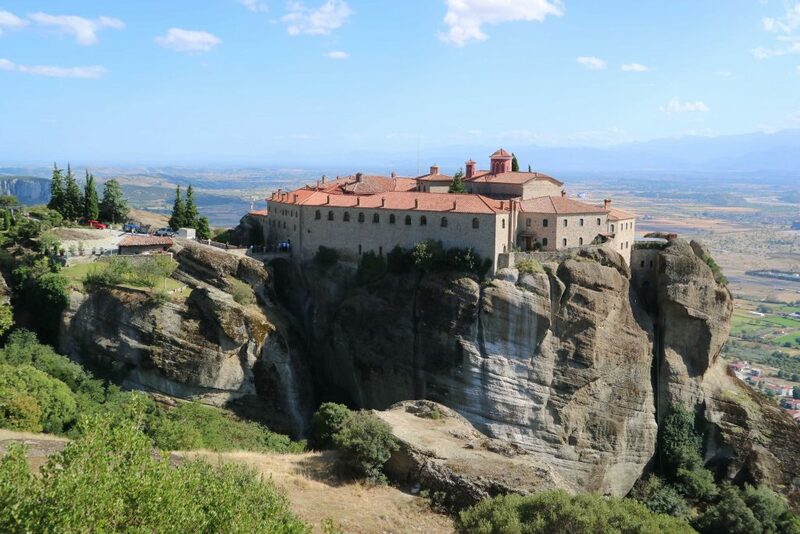 We talked about going to Meteora again but we definitely wouldn’t go to St. Stephen again. Although it looks quite large from outside, the places that allow visitors are very limited. There is a very small courtyard, a church and a small museum that displays some important items but it was under renovation when we visited. There is also a shop. I didn’t like the vibe in there but of course this is totally personal. There was a nun selling entrance tickets and a nun working in the shop. They were nice but I felt that they didn’t want to be there. It is very strange that the monastery decided to make the nuns do this sort of jobs. I imagine that they would rather be doing something meaningful instead of being sales assistants. The workers at the other three monasteries that we visited were all regular people except one monk at the Varlaam shop but he looked more like a big boss than a sales assistant. Can you see the bridge leading to Agios Stephanos? Train tickets can be bought online here. Book your tickets as soon as you have finalized your travel plan because from the online reviews we read, tickets do sell out. We traveled in September and the A class (upper class) car was completely full both ways. I ventured to B class to have a look and it looked really packed as well. A class cost only about 7 euro more than B class and the extra room was worth the little extra. 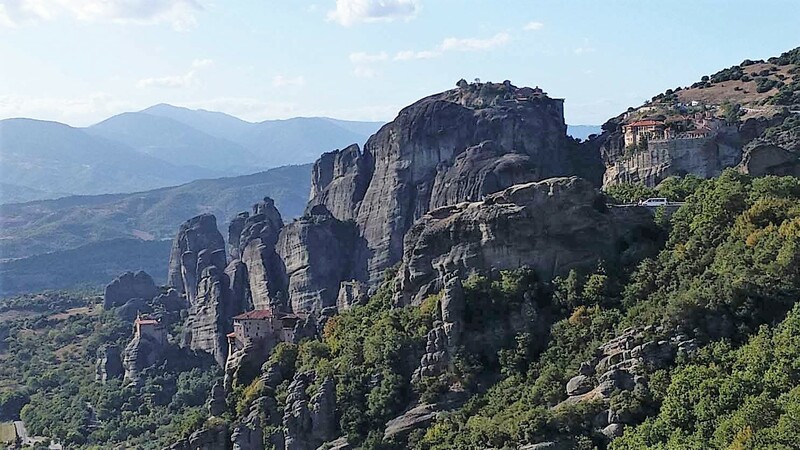 To visit Meteora, you will select train ticket for Athens to Kalambaka which is a village near Meteora. Agent Q was the one who bought the ticket online and she found the experience quite frustrating because the website wasn’t that user-friendly. Visit-Meteora composed a very detailed guide to use the ticket site that you might find useful. We did. 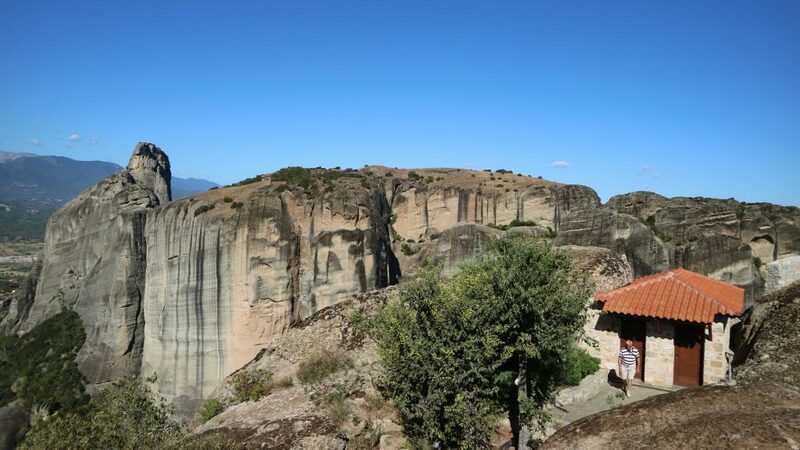 Its website offers other useful information on Meteora too even if you are not joining their tour. 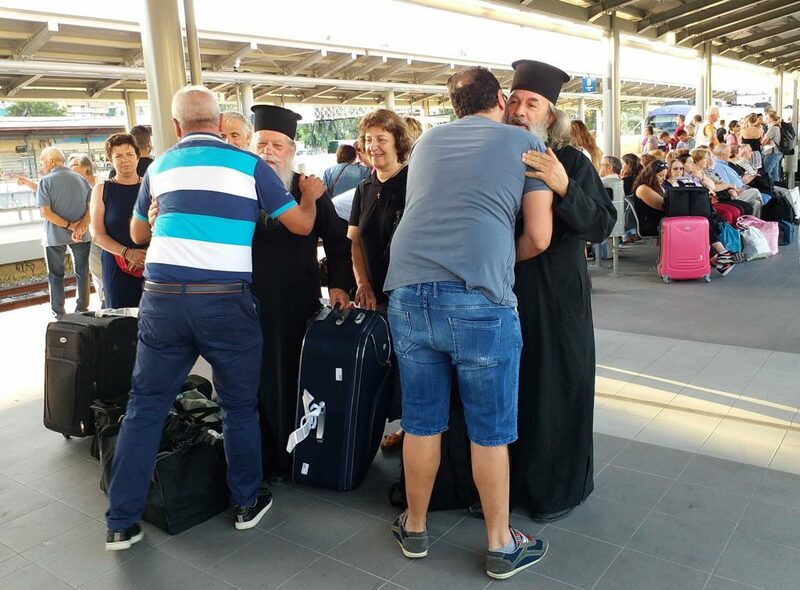 From Athens, you will board the train at Larissa Train Station. It is right next to Larissa Metro Station. Please note that there is a city in Greece called Larissa so please do not confuse the city with the metro/train stations in Athens. Priests at Larrisa Station. If you can’t find platform info, just look out where everyone and the priests are. Bus terminal at Kalambaka (right hand side of photo). The bus from Kalambaka to Meteora is run by Ktel company. You can find their timetable here. We got on the bus Kalambaka Bus Station (the terminal station) and it took about 30 minutes to arrive at the last stop St. Stephen. You can buy bus tickets either from the terminal station or from the driver when you get on the bus. It’s best to have some planning according to the not so frequent bus time table so that you can travel from one monastery to another by bus. It took us an hour to walk from the Holy Trinity Monastery to Varlaam Monastery not counting the steps. Walking is not difficult. All the roads are well paved and easy to walk. Take care because there is no pavement and you will be walking where the cars and buses are. If you plan to stay for the sunset like we did, have a phone number for taxi ready and your phone charged because it could get dark quite quickly. Agent Q and I got a bit nervous when it was getting dark and we realized that there were no street lamps. Fortunately a German couple stopped and asked us if we needed a lift going down. We were glad to have met these angels in real life. Meteora really is a special place and attract nice people like them. 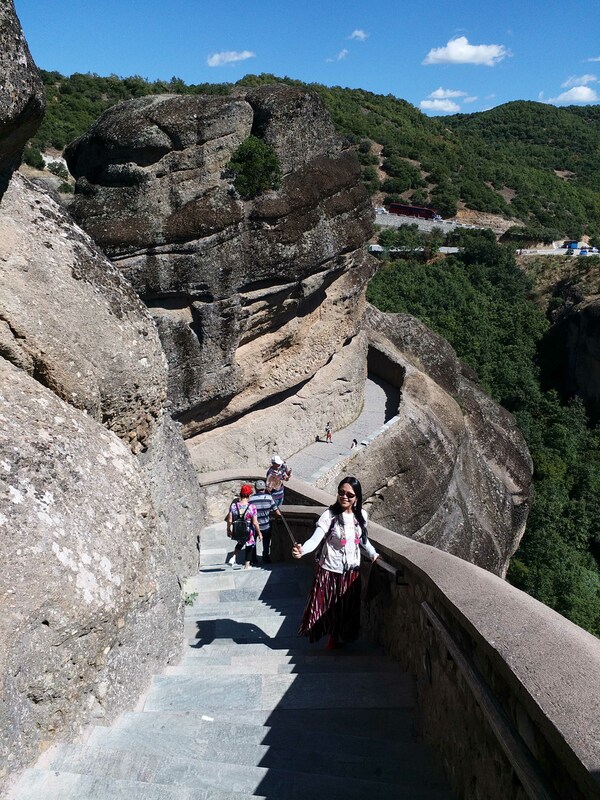 My friend Tiffany missed the bus and took a taxi to Meteora. She said it cost 10 euro. We were so excited in the bus when we spotted monastery resting high above! My favourite bus ride ever! The obvious choice is Kalambaka because it is where the train station is. The public bus went past Kastraki Village on the way to Meteora and it is rather pretty too alas not so convenient for us as we didn’t drive. Agent Q and I stayed at the Galaxy Hotel. We chose this hotel because it was one of the cheapest options (35 euro per twin room per night) and is near the train station. Although on the small side, the room was clean with a nice balcony and provided all we needed for our short stay. The staff members were very friendly and patiently provided all the information that we needed. Camera of course! Water, lunch/snack and some fruits especially on a hot day. A hat and sunblock would be useful too. 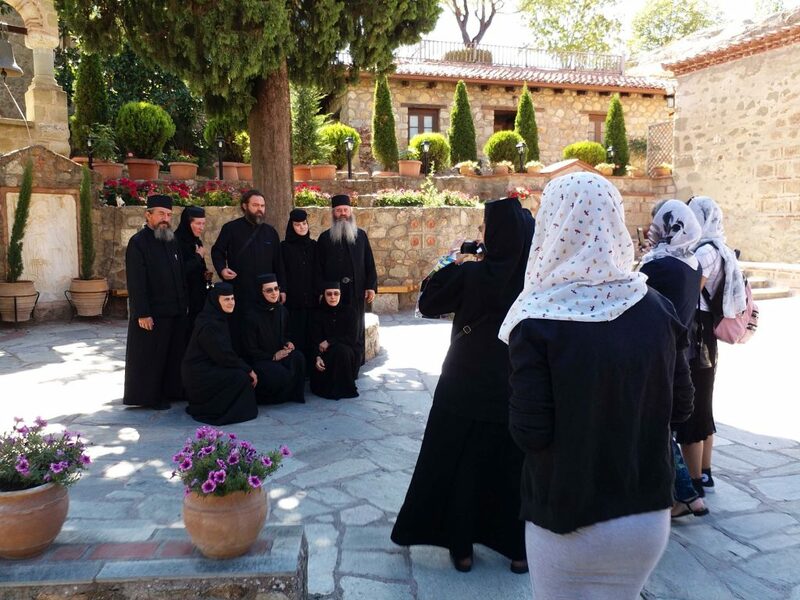 All monasteries require that the visitors dressed modestly meaning no shorts for men and women need to wear skirts that cover their knees. Strange rule with the skirt but the monasteries can make whatever rules they like. They provide long skirts but we don’t know how often the skirts are washed. Agent Q and I both wore long skirts for this journey but if skirts are not your thing, you can always bring a sarong with you and wrap your legs up before entering the monasteries. The workers selling entrance tickets do enforce this rule. One suggestion is to wear/bring portrait-worthy clothes! 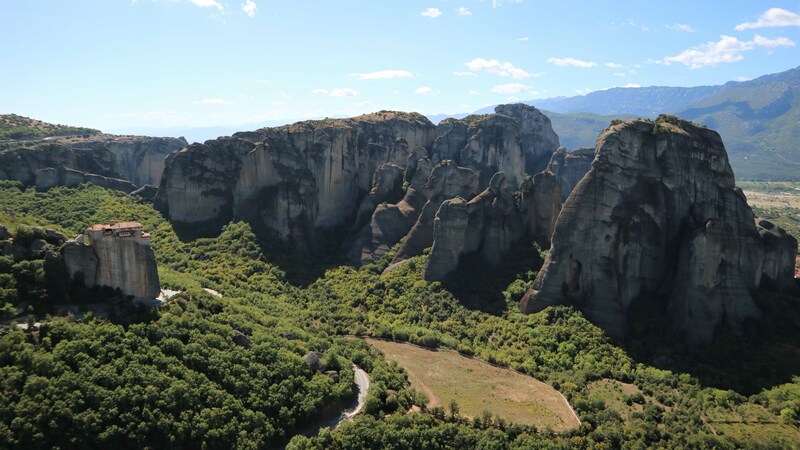 Meteora offers many great photo shoot locations. Wear comfortable non slip shoes because now and then you might want to venture to some cliffs that offer great views and these places are not paved and the rocks can be slippery. Oh the Wind!!! Not easy to be pretend model! Agent Q and I thoroughly enjoyed our visit to Meteora and we already plan to visit again. 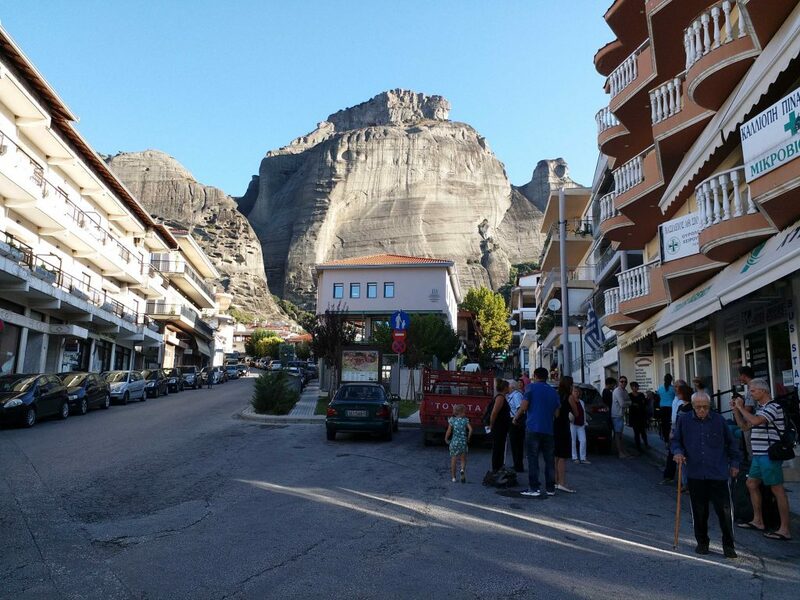 There are long distant buses that travel from Meteora to other areas of Greece that are worth visiting and we will definitely make a better planning next time to make little stopovers in order to avoid that long train journeys. **PhotoMan is my husband’s Super Hero name. 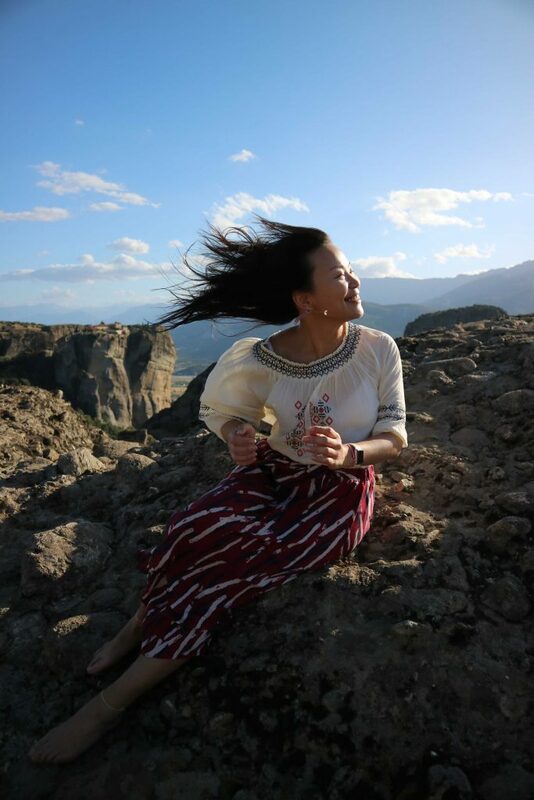 Check out journey of PhotoMan and HongKongWoman! *Q – Photos by Agent Q. All other photos by me unless otherwise stated. 3 Giant Mutant Penguins! We could have spent all day just looking at rocks! Dont forget to give thanks to the land where ever you go!